The library offers a wide variety of facilities, services and programs across the region. 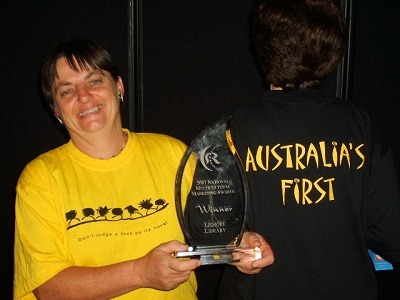 Lismore's Area Librarian, Lucy Kinsley, with a Multicultural award for the first Human Library in Australia. Lismore's Human Library aims to encourage understanding between people and to build social cohesion in the community. Regular sessions are held on the first Friday of the month from 11.00am to 1.00pm at Lismore Library. Living Books also visit local aged care facilities on a bi-monthly schedule. Other sessions are held by arrangement either in the library or at other locations such as schools.